Each fuel rail has SIX 8AN ORB ports, 12 ports in all. Four 8AN ORB plugs are included with the rail, intended for the end ports which cannot be used due to close proximity to other components. It is up to the installer to determine what additional fittings or accessories are needed. 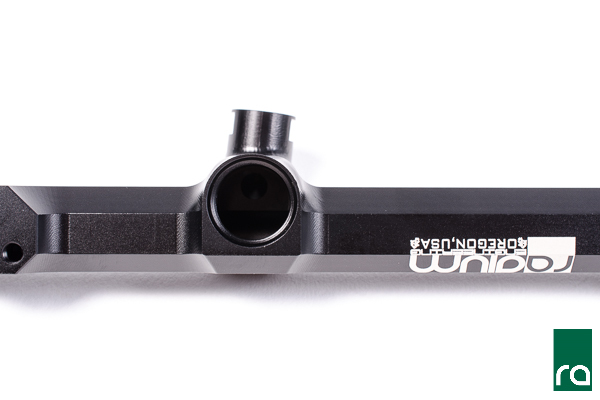 The fuel rails are CNC machined from 6061 aluminum, black anodized, and laser etched for a high quality surface finish. NOTE: It is advised that the fuel rails be mocked up on the engine before adapter fittings and fuel delivery accessories are purchased. This is necessary to check clearance of surrounding engine components which may interfere with accessing some of the fuel rail ports. 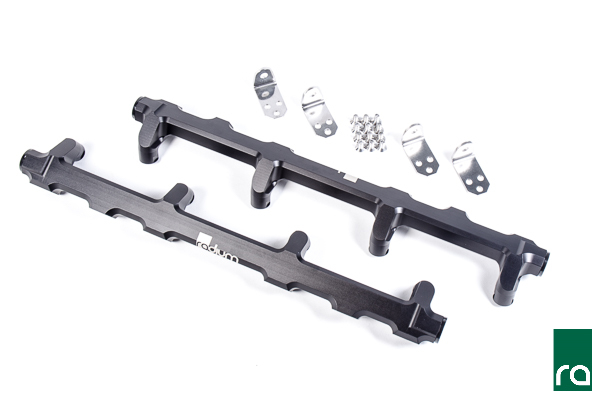 The kit features polished stainless steel brackets that attach to the factory fuel rail mounting points. No vehicle modifications are required. 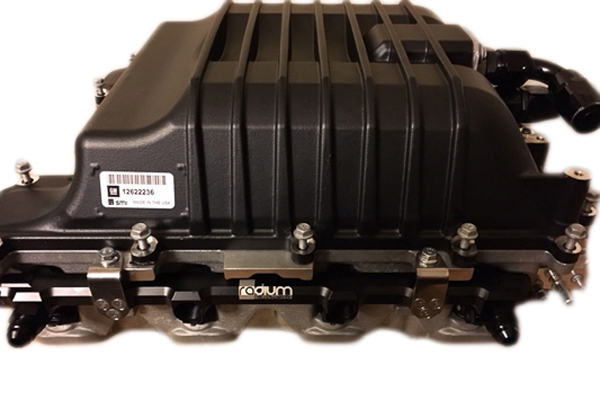 Like the OEM fuel rails, the injector bores are 14mm ID and are compatible with factory fuel injectors. 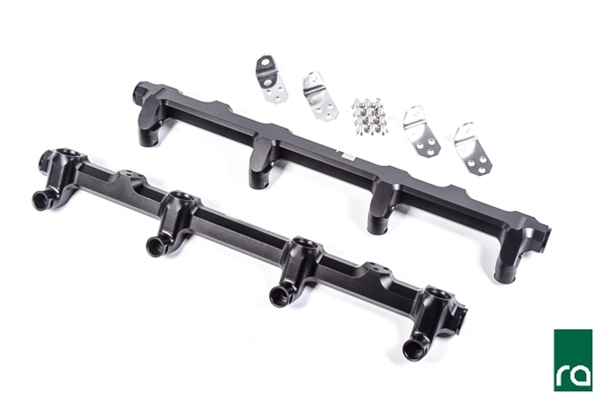 This fuel rail kit is also compatible with any aftermarket injector that is designed for fitment with the OEM fuel rail. Additionally, these rails have provisions for the factory injector clips, as shown below. 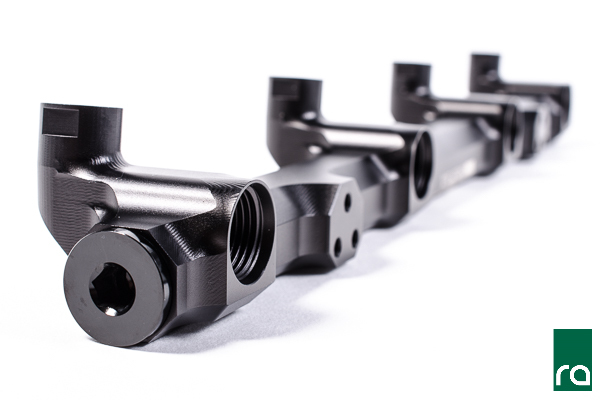 This rail is compatible with all fuel types including popular alcohol mixtures such as E85.